Dr. Thanos Paraschos - Fertility Specialist-Clinical Director. Dr. Paraschos qualified in medicine in Thessalonica, Greece in July 1988. He worked in different University Hospitals and in the Royal Postgraduate Medical School at the Hammersmith Hospital, with Professor Lord Robert Winston in London, UK. During this time he gained experience in human infertility problems and laparoscopic surgery. 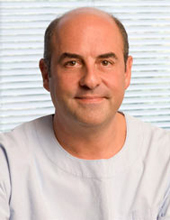 In 1996 he returned to Greece and founded Embio, Athens leading independent fertility and gynaecology clinic. For a full CV see here.